Two years and 150+ updates later, it's an unlikely success story (and one of the most popular games on Steam). The first thing you’ll notice about Nelson Sexton is his work ethic. Since the release of his free-to-play, sandbox zombie survival game Unturned in 2014, he’s developed, playtested, and implemented over 150 updates. Each one contains a small parcel of miscellaneous new content that’s airdropped weekly—sometimes daily—into a hungry community. A one-man operation can come with a lot of tedious pressure, but it also means you can deliver what you want without the hassles of a Q/A team or publisher approval. On February 5, in patch 3.14.1.3, he added a police helicopter, a thief costume, building decay, and back buttons to the main menu. On February 12, in patch 3.13.1.4, he added pancakes, waffles, pizza, and, of course, a nailgun. Every day Sexton wakes up and scratches a few more things off a vast itinerary, all small steps towards the everlasting goal of creating the perfectly limitless Walking Dead experience. The audience has waited decades for a developer willing to take that challenge, but instead of a billionaire conglomerate, they found an industrious 19-year old kid. Unturned has been downloaded 24 million times, making it the third-most-owned game on Steam. Sexton released Unturned on Steam when he was 16 years old. Since then it's been downloaded 24 million times—it currently has roughly as many owners as Counter-Strike Global Offensive, making it, best as we can tell, the third-most-owned game on Steam. Like many games of similar amateur origins, Unturned carries the same blocky, easy-to-program aesthetic of Minecraft or Terraria. Your goal is to sustain yourself on a zombie-infested Prince Edward Island, balancing four simple vitality meters representing health, starvation, thirst, and disease. There’s a crafting system, a skill system, a fort system, and a number of different servers promising unique spins on the difficulty and scalability of survival. In the two years since release Unturned has added a bounty of new weapons, animals, food items, buildings (anything from a research station to a mine tunnel,) new zombie types, a multiplayer-only arena game mode, and VR support. It’s clear that Sexton was influenced by the prototypical DayZ mod, and the promise of a truly visceral, modular, unforgiving, constantly expanding apocalypse—that these dreams are all built off of programming skills he honed at 15 is hugely impressive. In Hearthstone the community pleaded for two years before Blizzard finally acquiesced and gave them access to additional deck slots. EA held SimCity hostage to an always-online disaster until they alienated even the most ardent of Maxis fans. Capcom launched a feature-bereft Street Fighter V to make an aggressive release date, and, to the surprise of no one, has spent the following six months mollifying the player-base. The video game industry is built by giant companies, and giant companies tend to be stubborn, slow, and scatterbrained. Unturned’s patch notes are downright giddy by comparison. The game has consistently been in the upper 10 percent of Steam’s top 100 played games, and much of that can be chalked up to Sexton’s discipline. In the past Sexton has given access to his Trello (a project mapping website) to the community so people could always keep track of what new items, features, and fixes were in the pipeline. That’s no longer transparent due to the rumors it generated, but he still keeps a clear, open line of communication. The Steam Forums are particularly adorable; a sea of kids throwing out hyper-specific suggestions like better door animations and, um, a zombie-alerting airhorn. Christian, a 16-year old who’s been playing Unturned since day one, says Sexton’s warmth is what makes Unturned special. Sexton agrees that the constant patches are what keeps people engaged. You get the sense that he shares the same vision as his community. Every update makes the game more free, more expansive, more laissez-faire. The long-term goal is to have an experience where a player can do anything, but for now it’s nice to know that there’s somebody listening on the other end. Christopher had one of those moments. 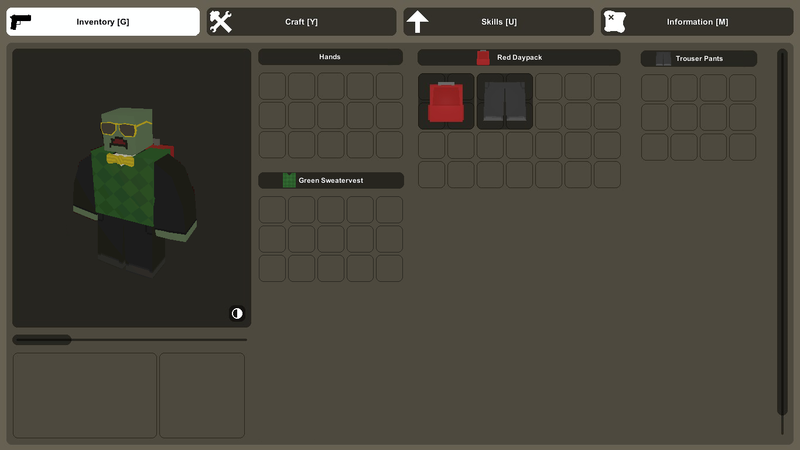 In 2014, around the time Unturned hit 3.0, there were some complaints about the inconvenience of managing your wardrobe if your character was wearing a lot of clothing. Sexton made a post on the subreddit looking for suggestions, and Christopher responded with a mockup he uploaded to imgur. Unturned is still free-to-play. You can hop in and enjoy the same experience as everyone else. There are no microtransactions or thresholds, and the only monetization is a one-time $5 upgrade which gives you access to special servers, unique clothes, and gold-plated weapons. This is enough for Sexton to sustain himself, and it’s not going to change anytime soon. Currently Sexton not in college, but says he’ll consider enrolling if he starts encountering problems in game development he can’t figure out on his own. He also mentions that there have been offers to take Unturned off his hands permanently. “I think it’s just too much of what I do and what I enjoy to sell it, I think I’d rather continue on having it being my hobby than have it become some corporate money-making thing,” he says. That makes sense. Technically speaking, Unturned hasn’t been officially released. It’s caught in that endless development cycle that defines a lot of Steam success stories. Unturned is Nelson Sexton’s whole life. His friends, his work, his portfolio, his livelihood, all wrapped up in a single project he started in high school. Will he eventually cash in? Maybe. Notch eventually sold Minecraft to Microsoft for $2.5 billion, and while Unturned hasn’t reached that level of cultural ubiquity, it’s still been downloaded almost 24 million times on Steam with plenty of branding and monetization options left unexplored. There may come a day when Sexton is a little burnt out and the buyout number is just high enough. But for now, he’s here. Game companies spend billions of dollars trying to reach their market. They invite Wiz Khalifa to play Battlefield One and hire Drake to say nice things about FIFA. Sexton just talks to them on forums. Millions of teenagers have pooled their resources to lift up one teenager to make his game for them. They’re all invested in the same fantasy. There’s nothing lost in translation.